Hey, Linden Labs! I know you’re working hard on two different projects right now, and that’s great. I also know you’ve mentioned being forced to do so because if you didn’t, someone else would replace the virtual worlds you’ve worked hard to build up. Right? This is Tower Unite, a catch-all theme park experience. You buy the game once and that’s it–you earn furniture with points from minigames. There’s also a pet and cooking system in development right now, as well as even more minigames coming in future updates. Tower Unite is popular with the gamer crowd and is very Youtube vlogger-friendly. Four Kings Casino is free upfront but contains optional microtransactions. You can’t cash out chips but trust me, it’s addictive to play this anyway. Home customization is upcoming. The user demographic for this is older people with cash to throw into games such as Second Life and the former PSHome (created by Digital Leisure, who now runs Four Kings). Four Kings is not only active on Steam, but Playstation as well. You might think Second Life and the upcoming Sansar are so different from Tower Unite and Four Kings, there would be almost no overlap of user demographic. Wrong! Watch what Markiplier says at the 4:35 in this recent video. He states this while he and a friend are playing Rust. Would Markiplier play Second Life for anything other than comedic effect now that you’re promoting Sansar? Nope. Keep your planned control on merchant stores. You’ll need it for when someone–ahem–makes something like angel wings that skyrocket av render weight to 700k. Do not rely on your userbase to create the communities you want to see develop in Sansar. You need to creates those communities. Think artist micro-residencies as a good start. Don’t charge hundreds of dollars for hosting fees. Make maps p2p optional. If p2p maps violate a merchant agreement, then maybe don’t let people sell goods in the game through you, right? Or disable certain objects when users want an offline session. Charge upfront for users to purchase Sansar. Implement a basic cooking/growing/pet system into Sansar that anyone, anywhere in Sansar can enjoy. Still want that casino project to take off? Charge an entry fee to enter the game map. Any “chips” users earn can go to perks such as exclusive, customizable homes, furniture, rare pets, and clothing. Most importantly, call Sansar a game. It’s a game. “Game” is marketable. “Game” is Youtube-friendly. Selling a virtual life is not Youtube-friendly. It’s entirely possible to advertise creativity with art and science communities while catering to gamers as well. But you know what no one likes? Advertising a game as a replacement for irl. The tech world has evolved beyond that, and so LL must do the same. Those are a few suggestions to glean from the games I’ve listed here. Play them! Take a look around. Then jot down some notes and see what you can bring back from the trip. Have a suggestion? Agree or disagree with my post? Let me know in the comments! Your post makes no sense whatsoever. The “copies” of Second Life are all opensim places following the same model. That aside, Blue Mars was a fluke, IMVU doesn’t compare and… that’s about it. Everything you listed is totally unrelated and has zero relevance. While the grid in dwindling, the ONLY concern LL should have is managing a way to transfer inventory or refund players in thousands of L$ should they opt to “move” to another grid. I’m pretty sure that’s the unique and sole concern of the normal resident. Hi! Thanks for dropping by. Well, it makes sense from a business and marketing perspective, and from a game dev perspective. I don’t think SL ever figured out what it wanted to be, and that’s why LL is having to hit the restart button with a new game now. If what I listed had zero relevance, then why did Linden Labs attempt to place Second Life on Steam? That’s because… they want the gamer market! 🙂 They also need young blood, and guess what younger users are used to? Games like Rust, Tower Unite, Gmod, etc. They need that gamer money! Plenty of relevance here. Well, the games in the vids don’t interest me. Too gimicky and gamey. Great graphics, but I get bored with game play real fast. And that “customize your own condo” feature is not that great. I tried that kind of thing in other virtual world games it got boring real fast. I do agree that Sansar could create some superduper game type places to attract users. And sure, why not have a some basic home lifestyle systems for every user. I wouldn’t mind a work system too. Regardless of what they do or don’t so, ease of use for new users is probably the biggest factor in getting millions of users. They could also have more advanced user interfaces for experienced users. Yes, something where users can opt-out if they aren’t interested in games and can do their own thing, would be great. That way there’s something for everyone. What you just suggested would make users of the end result product die off a whole lot quicker than SL has, which has been more of a slow trickle downwards. I really don’t agree on some of your points. Whatever comes next, it should be “Shared” and “Open Ended”, yes there can be some catered things but DO NOT forget about giving amazing tools / creation possibilities to the users, and Do Not close of avenues even if they are adult related. Part of what made Second life Sustain for over 13 years is lost in what you said, many other games come and go quite quickly that youtubers jump on in a fleeting moment. 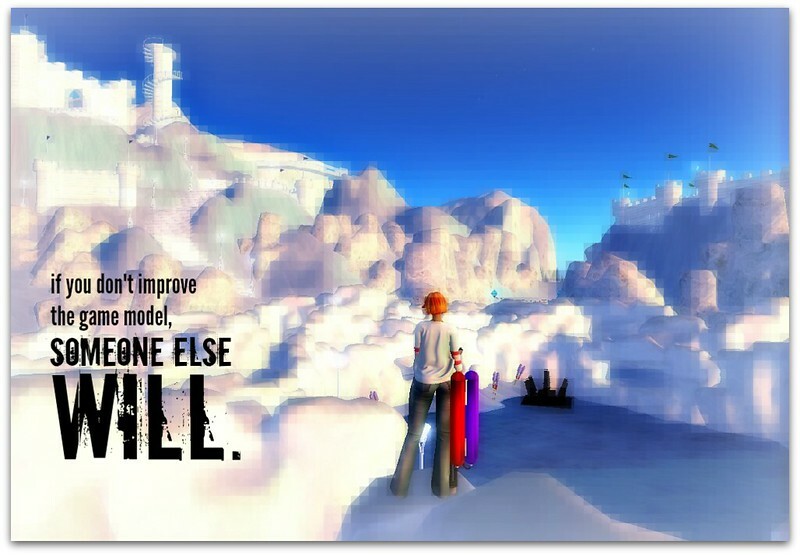 SL wasn’t the best at anything but, you have a whole lot of options to create and explore a lot of varied experiences and options. Some of your suggestions would end up making whatever is the result of your vision dying out in 6 months to two years as people get bored even quicker as once you’re passed the defined / catered experience, it’s done, it’s over, it is too clean, repetitive and limited, time to move onto something else. There’s really nothing that rivals Second Life at the moment with everything that it offers. That claim is very bold. A major part of it is most companies will not want to take a risk and let users have a lot of freedom in creation due to censorship nightmares. The freedom to a point that SL has brought is both good and bad in some areas depending on your own morals and views on things as well as corporate views. I’d rather have flaws but a more open creation system that is less caterted and monitored. 1) “Planned control on merchant stores” This has numerous effects outside of just keeping people efficient. It affects the freedom to create and promotes sensorship & favoritsm. 2) Relying on their userbase is part of what made Second Life great, while it was a rough start and sparse to start off with look how far Second Life has come. Of course there could be more catered areas, but don’t close off the tools and options for driven people to shape areas and communities the way they want. 3) Enabling p2p for areas is dangerous and concerning and even more prone to holes than a closed hosted solution, it opens the possibility for data theft and privacy invasion if strong encryption isn’t used and flaws/exploits. What happens when an awesome area is created, but no one has the data to pass on for it? You’d still need a backup solution to retain that data and pass it onto another user, else it’s gone until the next time someone with all the data is there or multiple people with chunks to makeup the needed assets. 4) Charging upfront is an okay idea especially if you want to cater to adult content, but it’s also not a sustainable model to have a one time buy in fee. You’d either need subscriptions or micro transactions to sustain the hosting costs of such a large world. 5) Basic pet/cooking/growing system is nice, but can users add onto it or create their own system? The rest of your points pigeon hole SL’s successor needs to be a defined “Game”, this would take away a lot of what makes SL what SL is. It removes a lot of creativity, imagination and the entire point of a Metaverse. There should be a open set of tools and structure created with a more efficient backend system, sure LL or whoever else could create catered items and systems, but don’t forget the ability to let others do in-depth creation themselves. Having the ability to script, animate, use 3d models/textures opens up some many avenues. They’re missing out leveraging adult content as well. There really should be multiple tiers of access to areas as always, people could go play better defined, more efficient running games both catered and user created in a PG setting or Teen, or go off and live a second life if they wanted to all depending on their preference.